In the last few posts on learning I've been reviewing a number of tools that help us, as software developers, learn.The final tool we'll look at in our arsenal is a powerful old favourite: the mind map. 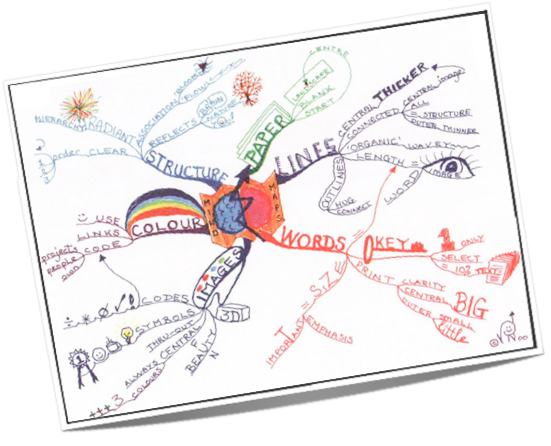 Mind maps are a powerful outlining technique that appeases the left brain's linear organisational fetish whilst satisfying the right brain's spatial, relational desires. Mind maps are structured outlines in which you start with a key concept in the middle and add information around it forming a web. You can add extra relations between items, and freely use colour, illustration, size and position to highlight extra information. I often produce mind maps for talks and articles I'm writing. Being an unashamed sad geek, I tend to produce these electronically (I used FreeMind which works on Windows, Mac, and Linux). Then I can keep them under source control and version them alongside my articles. However, many people claim that you will miss the full benefit of the mind mapping technique by doing this. The more visceral, physical act of creating a hand-written version helps you explore and retain information. By laying out the relations yourself rather than relying on a machine to typeset the “document” for you, you consider inter-relations and build a tangible picture in your mind that will aid later recall. Next time you're learning, why not try to record knowledge in a mind maps you go? When investigating a learning route and working out what you need to know, record your findings in a mind map. 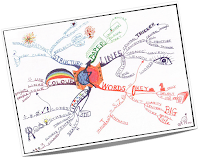 Use mind maps to catalogue information. They are a proven, powerful tool. I often find that people get frustrated with mindmaps as they do not know how to use them properly. My top tip is create them in two stages. First stage is just get everything down. Do not introduce structure at this stage - just get everything down. Then sit back and look for structure add lines etc. Then do a final chart. The issue with visual thinkers is that we need to separate out the information from the structuring.